DOM SHEED is a ready-made AFL players and is likely to play in the NAB Challenge, Eagles teammate Scott Selwood believes. Selwood, who was recently announced as the Eagles' new joint vice-captain with Josh Kennedy, played nine matches in his first year in 2008 after being recruited with pick No.22 in the previous year's national draft. The 2012 best and fairest says he has been very impressed with Sheed throughout the pre-season. 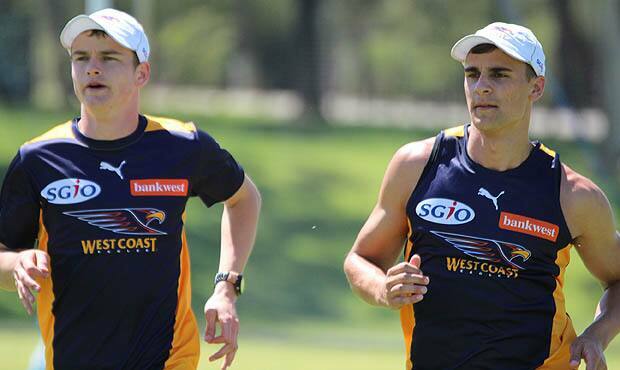 "Dom's a guy with a big build who can come in and is ready-built for AFL footy," Selwood said. "He's still got a lot to learn in terms of game-plan and structure and things like that but in terms of his attitude and the way he goes about it is first-class." The Eagles have taken a few days out of their preparations for the NAB Challenge by visiting Albany, one of the southern-most towns in WA, for their Australia Post Community Camp. The break has allowed Selwood the opportunity to reflect on his elevation to a senior leadership role at the age of 23. "I was absolutely rapt and shocked at the same time," Selwood said of the appointment. "I didn't know how it would go or who would get voted in. "We've got very strong leadership qualities within the whole playing group and I was absolutely stoked to be in there as vice-captain and hopefully I don't stuff it up." Selwood is following in the footsteps of his older brother Joel, who became Geelong captain at the same in age in 2012, although he has not leaned on his brother for too much advice. "A little bit every now and then," Selwood said. "It's hard because we're different players and he doesn't know the club, but we've got some great players who have helped me out and I know they've helped the other boys out, guys like Dean Cox and also past players that have been there. Andrew Embley was very good in helping me with that kind of stuff." Selwood also doesn't believe the Eagles vice-captaincy appointment will lift him up a notch within the family. "(Joel) has still got three premierships on me," Scott said. "That's the one that counts in the Selwood family unfortunately." The Eagles midfielder expects to play more of a run-with role in 2014 than he has done in the past two years. "We've lost a couple of older guys in Andrew Embley and Daniel Kerr and we'll start bringing in some new guys. "I think it's probably better that they can go out there and just play footy and then I'll probably go back to playing more of a defensive role."